Let's be honest: Apart from some of the very weird ones showcased on this site (like this spate of them in Amsterdam and this naughty one in Iceland), museums can be boring. Particularly if you think of the entire world as a living museum, the idea of unnecessarily spending the day within four walls negates traveling at all, at least to destinations boring enough that museums can be considered a highlight there. Yet you probably encounter exceptions to this rule with some regularity, from those listed above to the place you'll discover below: Japan's Itchiku Kubota Art Museum. 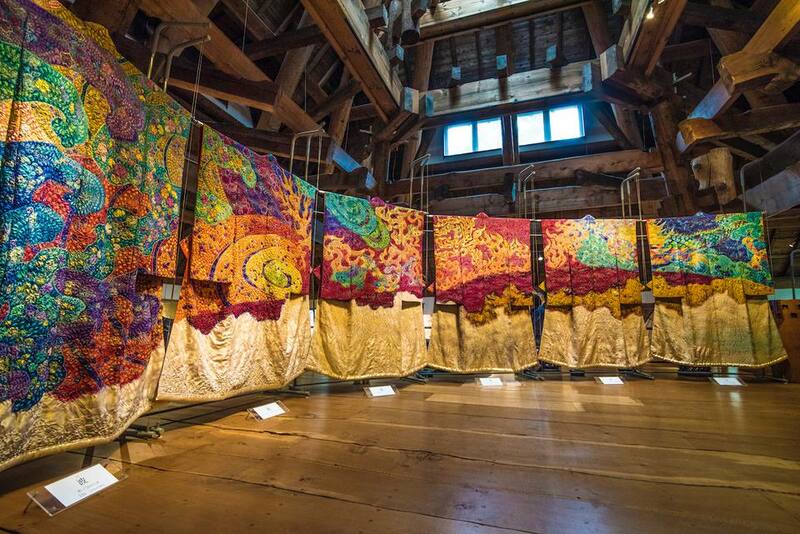 Dedicated to the work of the late Japanese artist Itchiku Kubota, who revived an ancient style of kimono-dyeing to prominence, the museum spotlights the Japanese traditional garment in a way that makes it more beautiful than it was. Born in 1917, Itchiku Kubota led a life full of intense trials (most notably, imprisonment during World War II) prior to discovering Tsujigahana, an ancient style of kimono dyeing not widely used since the Muromachi Period, nearly 400 years earlier. He held his debut exhibition in 1977, when he was 60 years old, and showcased his work around the world for nearly two decades before he opened his own museum on the shores of Lake Kawaguchi, in 1994. A celebration of the kimono as a work of art, the Itchiku Kubota Museum presents Kubota's most prized kimonos in a manner that requires neither an understanding of Tsujigahana or even the significance of the kimono in Japanese culture to enjoy them. From long rows of kimonos whose contiguous designs combine to create panoramic portraits, to individual garments bearing images of Japanese symbolism like nearby Mt. Fuji, a visit to Itchiku Kubota Museum elicits immediate fascination from anyone who sets foot inside, even (and perhaps especially) if you don't usually like museums. The only bad news? Itchiku Kubota died in 2003, which means you won't be able to meet him when you visit, and there's not anymore of his work to look forward to in the future. A pity, although the world is lucky his existing work lives on. After you finish exploring the kimonos, some of which rotate in and out periodically, head over to the museum café and tea garden, which is housed inside Kubota's former workshop. There, you can sip fine Japanese teas and coffees while you browse various pieces of Kubota's work (and other artists' Kubota-inspired work) for sale, including ready-to-wear kimonos. Alternatively, take your beverage outside and enjoy the garden, which on clear days offers views of Mt. Fuji. Even if a cloudy sky rises over you on the day you visit, you'll be sure to appreciate the aesthetic of the garden and the building, for which Kubota took inspiration from famed Catalán artist Antoni Gaudí. To be fair, you probably noticed this as you entered through the seemingly random stone arch that invites you onto the museum grounds, or the large goldfish pond you passed on the way to the main entrance of the museum building. And you must admit: There is something slightly surreal about resurrecting a centuries-old art and fashion form, and presenting it in a way that draws awe and admiration from thousands of modern visitors per year. The closest large airports to the Itchiku Kubota Art Museum are Tokyo's Haneda and Narita airports, frequent service to which from North America and Europe provides your best chance of finding cheap flights to Japan in advance of your trip. From Tokyo (or anywhere else in Japan), travel via train to Kawaguchiko station, then take the so-called "Loop" retro bus 25 minutes to the museum, which sits near the northern shore of Lake Kawaguchi. Visit the museum and nearby Chureito Pagoda, a prime spot for viewing Mt. Fuji in all four seasons (but especially during cherry blossom season in spring), for a truly spectacular Fuji-viewing day trip from Tokyo. Alternatively, add in sunset along the shores of Lake Kawaguchi—or, in the summer months, a climb up the mountain—for a weekend trip you won't soon forget.